Hong Kong cuisine is mainly influenced by Cantonese cuisine, European cuisines (especially British cuisine) and non-Cantonese Chinese cuisines (especially Hakka, Teochew, Hokkien and Shanghainese), as well as Japanese, Korean and Southeast Asian cuisines, due to Hong Kong's past as a British colony and a long history of being an international port of commerce. From the roadside stalls to the most upscale restaurants, Hong Kong provides an unlimited variety of food and dining in every class. Complex combinations and international gourmet expertise have given Hong Kong the reputable labels of "Gourmet Paradise" and "World's Fair of Food". With Cantonese ethnicity making up 94% of the resident population, Cantonese cuisine is naturally served at home. A majority of Chinese in Hong Kong are Cantonese in addition to sizable numbers of Hakka, Teochew and Shanghainese peoples, and home dishes are Cantonese with occasional mixes of the other three types of cuisines. Rice is predominantly the main staple for home meals. Home ingredients are picked up from local grocery stores and independent produce shops, although supermarkets have become progressively more popular. Hong Kong's dining lagged behind the then-leader of Chinese cuisine, Canton, for a long time and many Hong Kong chefs spent their formative years in Canton. Canton was renowned for its food, and there was a traditional saying of "The food is in Canton" (食在廣州). Cantonese cuisine in Canton reached its peak during the 1920s and was renowned in the care in preparation even for peasant fares such as char siu or boat congee. Dasanyuan was renowned for its braised shark fin dish that charged 60 silver yuan, equivalent to 6 months' wage for a working-class family. The Guandong cooking style eventually trickled down to the culinary scene in Hong Kong. By the 1960s, Hong Kong was past the worst of the economic depression, and there was a long and continuous period of relative calm and openness compared to the Communist rule in Mao Zedong-era China and martial law isolation in Taiwan. The Cantonese cuisine in Hong Kong had by then surpassed that of Guangzhou, which had witnessed a long period of decline after the Communists came to power. The rising prosperity from the mid-1960s had given birth to increasing demand for quality dining. Many of the chefs, who spent their formative years in pre-Communist Guangzhou and Shanghai, started to bring out the best of fine dining specialties from pre-1949 Guangzhou and Shanghai. Families had largely abandoned catering services and resorted to restaurants for celebratory meals. Seafood started to become specialised delicacies in the 1960s, followed by game in the 1970s. This wave of prosperity also propelled Hong Kong Chinese's awareness of foreign food trends, and many were willing to try foreign ingredients such as asparagus and crayfish from Australia. Foreign food styles such as Japanese and Southeast Asian cuisine started to influence local food, and the pace of change accelerated during the late 1970s and early 1980s. This gave birth to nouvelle Cantonese cuisine (Chinese: 新派粵菜; Cantonese Yale: Sānpaai Yuhtchoi) that incorporated foreign dishes such as sashimi into Cantonese banquets. 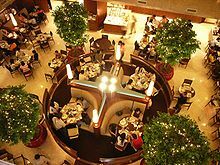 For the first time, many Hong Kong Chinese started to have the economic means to visit many Western restaurants of the domain of mainly wealthy expatriate Westerners such as Gaddi's of the Peninsula Hotel. During these years, there was great wealth growth from stock market investments, and one visible manifestation of the resultant nouveau riche mentality in 1970s Hong Kong were sayings such as "mixing shark's fin soup with rice" (Chinese: 魚翅撈飯; Cantonese Yale: Yùhchi Lōufaahn). China initiated economic reforms when Deng Xiaoping came to power after Mao Zedong died. The opening up of the country gave chefs from Hong Kong chances to reestablish links with chefs from mainland China severed in 1949 and opportunities to gain awareness of various regional Chinese cuisines. Many of these cuisines also contributed to nouvelle Cantonese cuisines in Hong Kong. The lift of martial law in Taiwan in 1987 jump-started Taiwanese links with mainland China and has caused a proliferation of eateries specialising in Taiwanese cuisine in Hong Kong as Taiwanese tourists and businessmen used Hong Kong as a midpoint for visits to mainland China. From 1978 until 1997 there was no dispute Hong Kong was the epicenter of Chinese, not merely Cantonese, cuisine worldwide, with Chinese restaurants in mainland China and Taiwan, and among overseas Chinese communities, racing to employ chefs trained or worked in Hong Kong and emulating dishes improvised or invented in Hong Kong. Hong Kong-style Cantonese cuisine (Cantonese Yale: Góngsīk Yuhtchoi) became a coinword for innovative Chinese cuisine during this period. It was even unofficially rumoured the Chinese government had secretly consulted the head chef for the Peking Garden Restaurant of Hong Kong, part of the Maxim's restaurant and catering conglomerate, to teach chefs back at the renowned Quanjude restaurant in Beijing how to make good Peking duck, Quanjude's signature dish, in the early 1980s as the skills to produce the dish were largely lost during the Cultural Revolution. After Hong Kong was returned to China in 1997, the Asian financial crisis and SARS epidemic led to a decade-long depression. The boom in Hong Kong culinary scene came to a halt and many restaurants were shuttered, including a number of renowned eateries such as Sun Tung Lok. It is argued that the catch up in prosperity among populations from coastal regions of China, particularly the nouveau riche (derogatory Chinese: daai foon 大款) and corrupted officials (derogatory Chinese: daai ye 大爺), has driven up the demand of many delicacies such as abalone and grouper, and many celebratory dishes have become outrageously expensive that they are beyond the reach of even many upper-middle class Hong Kong families. At the same time, Hong Kong people's tastes have become cosmopolitan when compared with one generation ago. Many are now able to appreciate specific European cuisines rather than one generic "Western cuisine", and appreciation of other Asian cuisines, especially Japanese cuisine and Thai cuisine has been ever increasing. These have produced a proliferation of many specialist ethnic cuisine restaurants geared towards young middle class couples on one hand, and a consolidation of fine-dining Cantonese restaurants on the other. Historically, Hong Kong's food source came from a combination of mini stores instead of supermarkets. Some of the stores included: rice dealers (Chinese: 米舖; Cantonese Yale: Máihpou), serving as mini rice storage warehouses; wine shops (Chinese: 辦館; Cantonese Yale: Baahn gún), which offered beverages; convenient stores (Chinese: 士多; Cantonese Yale: Sidō, Cantonese rendering of "store"), which were single convenient stores, most notable for serving fresh baked bread. The main component was wet markets (Chinese: 街市; Cantonese Yale: Gāaisíh) – one of the first market gatherings in Hong Kong was Central Market that began in the 1840s. Most restaurant serving sizes are considerably small by international standards, especially in comparison to most Western nations like the United States and Canada. The main course is usually accompanied by a generous portion of carbohydrates such as rice or mein (noodles). People generally eat 5 times a day. Dinner is often accompanied with desserts. Snack time also fits anywhere in between meals. 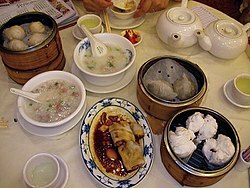 As Hong Kong is Cantonese in origin and most Hong Kong Chinese are immigrants or descendants of immigrants from Cantonese-speaking regions of China, the food is a variant of Cantonese cuisine – almost all home-cooking and much of the dine-out fares, from restaurant to bakery, are Cantonese or heavily Cantonese-influenced. Most of the celebrated food in Hong Kong such as the wife cake, roast duck, dim sum, herbal tea, shark's fin and abalone cooking, poached chicken, and the mooncake, and others, originated in nearby Guangzhou, and dai pai dong was an institution adopted from the southern Chinese city. As in the parent cuisine, the Hong Kong Cantonese cuisine accepts a wide variety of ingredients, a lighted seasoned taste. Unlike Guangzhou, the uninterrupted contacts Hong Kong has with the West has made it more susceptible to Western influences, and has produced favourites such as egg tarts and Hong Kong-style milk tea. In addition, other foreign styles of cuisines are also popular in the territory, although almost all offer one of generic Western (authentic, international, or Hong Kong-style), Italian, French, Korean, Japanese, Thai, Vietnamese, Indian, Indonesian, Malaysian and Singaporean cuisines. Most East Asian cuisines, with the exception of fusion and Thai, are consumed exclusively with chopsticks; to ensure good hygiene, customers are to have two pairs of chopsticks, one to pick up food to put on their plate, and one to eat with. The more Western style cuisines favour cutlery. Some meals are more suited for the use of hands. One notable trend in restaurants is the limited number of napkins provided during a meal. Most mid to low-tier restaurants operate under the assumption that customers bring their own napkins or tissue packs when dining. In all cases, there is no ice water, instead preferring hot water; this is because of the belief that water that is cold to begin with is not sanitary to drink. This hot pot cuisine, known as daa bin lou (Chinese: 打邊爐; pinyin: dǎbiānlú; Jyutping: daa2 bin1 lou4) in Cantonese, is unique in the sense that everyone is a chef. A boiling pot of water (soup-based, and customers can choose their preferred soup taste), is placed in the center of the table, and essentially everyone boils their own ingredients in that pot. This is highly popular and is usually accompanied with a bottle of cold beer or soda. This style is common during frigid winter times, since people are essentially huddled around a fire. This format is also considered entertaining. A large wide variety of tea leaves and combinations are used for Chinese tea. In the 1950s and 1960s, citizens would go to tea houses accompanied by their pet birds locked in a bird cage. [clarification needed] Noon tea was an essential break in the middle of the day. Tea nowadays goes along with any meal. Dishes derived from cuisines of the Western world, but not classified into a particular country, belong in this category. Outside Hong Kong, it is termed Hong Kong-style Western cuisine or Canto-Western cuisine. Small restaurants that offer Sai Chaan are usually cha chaan teng at the popular end or "Sai Chaan Restaurants" at the more upscale range. Restaurants that have come to expect tourists will likely offer both east and west menus. Most dishes are localised with Chinese tastes and contain Chinese and specifically Cantonese influences, such as steak marinated in soy sauce, served in a soy sauce dominated gravy, and with fried rice as on the side, or pasta. Western drinks include milk, smoothies, berry filled-drinks and so on. Franchises coffee chains have become more popular in recent years, with the arrival of Pacific Coffee and Starbucks. UCC Ueshima Coffee Co. and Pokka Cafe are among the first to introduce siphon coffee to Hong Kong. This brewing method has only become more familiar to the public after the establishment of Xen Coffee, a siphon speciality coffee shop. While independent coffee shops do exist, franchise stores are often situated in favourable locations that cater to foreign workers. Oyster and Wine bars have been blooming in recent years. Most of those shops are located in Happy Valley and Tsim Sha Tsui. In Hong Kong Island, famous bar districts are located in Wan Chai, such as Fenwick Street, Lockhart Road, Tonnochy Road and Jeffe Road. These areas were recreational spots and resting areas for sailors and foreign navy parking by around the 1960s. These steer together contributed to the development of the Wan Chai Bar District. In Year 1978, there were approximately 1757 restaurants with liquor license, only 241 of them were considered as licensed bars. Applying and keeping a liquor license for a bar costs around 1000 HKD per annual, while liquor license for restaurants are at 500 HKD per annual and nightclubs are at 250 HKD per annual. During the 1980s, bars had long opening hours as it was one of the most glorious moments of the Bar industry in Hong Kong. The view of bar's neon light signs and their slogan used are some of the unique features in the past. ^ a b Sterling, Richard. Chong, Elizabeth. Qin, Lushan Charles  (2001). World Food Hong Kong. Hong Kong: Lonely Planet Publishing. ISBN 1-86450-288-6. ^ Hong Kong census. "Census labour data pdf." Labor. Retrieved on 14 March 2007. ^ HK Census. "HK Census." Statistical Table of population. Retrieved on 16 March 2007. ^ HK Census. Hong Kong Census." ^ HK Census. "HK Census." Statistical Table. Retrieved on 8 March 2007. Wikivoyage has a travel guide for Hong Kong Culinary Tour. 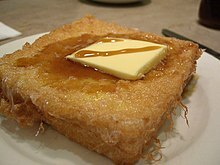 Wikimedia Commons has media related to Cuisine of Hong Kong.